The basing of over 50 trees on metal washers (bases still need to be painted), construction of three log cabins (still work in progress) and rushing through several figures for the game. 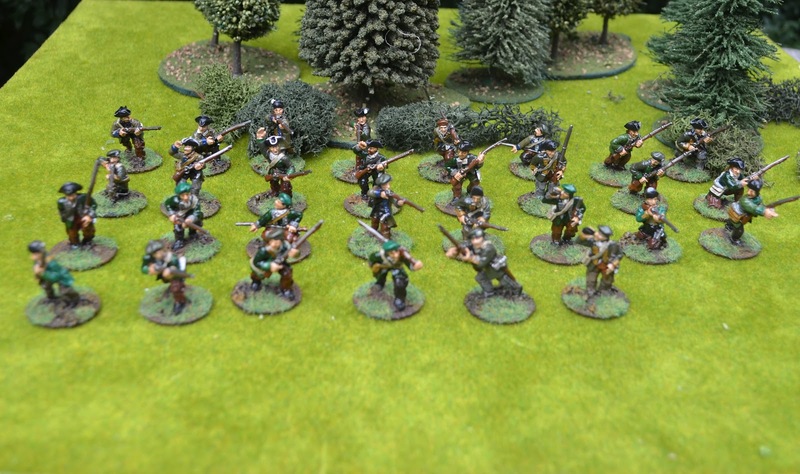 Even though the points came out equal (give or take a 15) the British Force appeared much stronger – must check the maths. For those of you unfamiliar with the Musket & Tomahawk rules they are a fast paced, card driven skirmish rule set for the French Indian wars of the mid 18th century. Each unit typically consisting of between 6-8 figures is classified by it type (eg Regulars, Irregulars, Indians and Militia/Provincials). 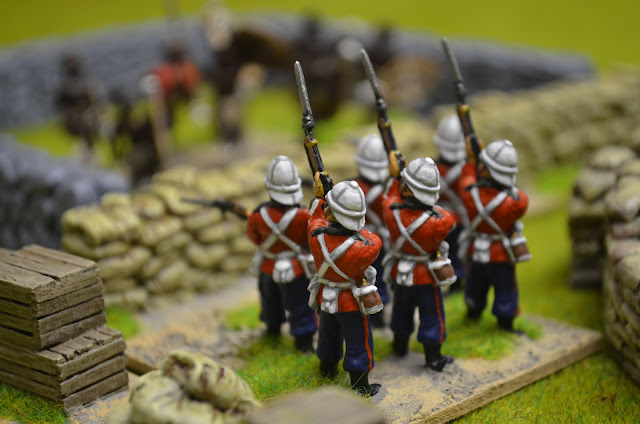 Depending upon the troops on the table the appropriate cards are shuffled into the deck. A turn finished when all the cards are turned over. When a card is turned over that force displayed may perform an action with all those troop types shown (move, fire, reload etc). 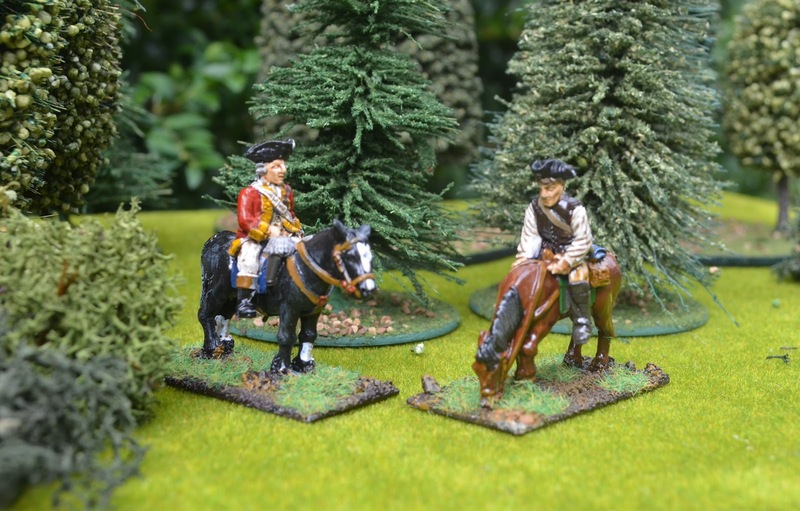 Most units get four action cards in the deck so it is possible but unlikely that one side could move all of its units before the opposition get to go. 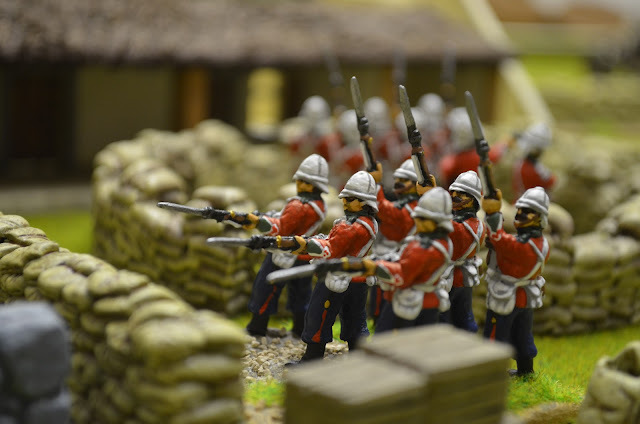 Significantly regular troops get only two cards but they get two actions per card – so they could fire and reload at the same time. 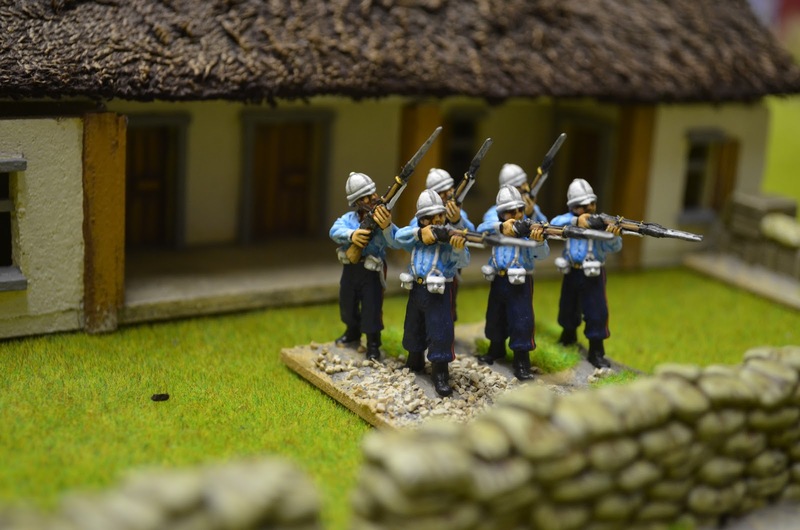 This reflects the disciplined nature of these troops. 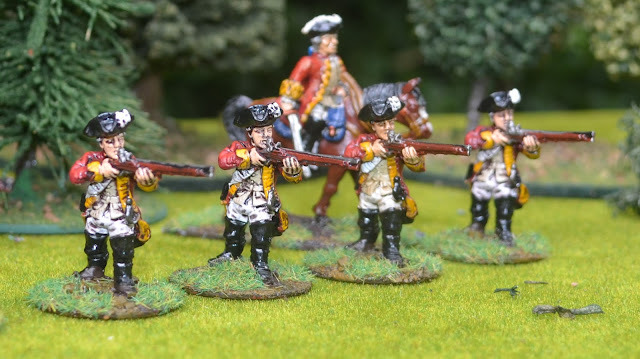 In addition an officers card allows a unit within 6 inches to perform an extra action. 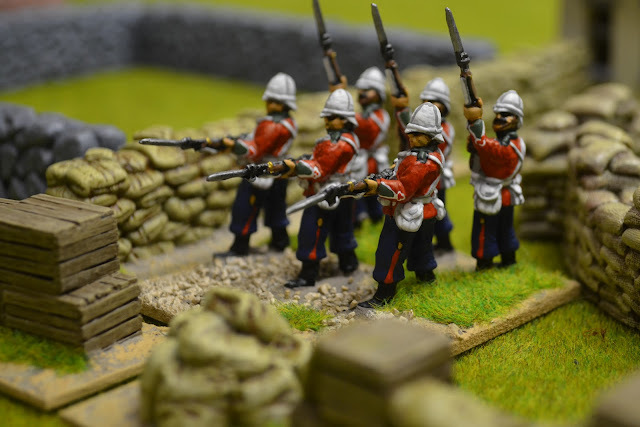 Combat is dice driven with scores to hit driven by the units shooting prowess and other modifiers (eg range, cover, rifles etc). 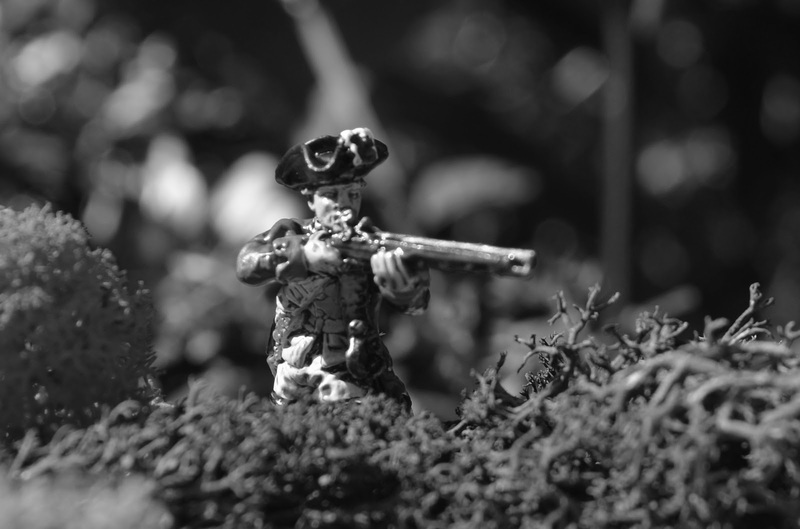 If a unit is hit, a dice is rolled for a lethal kill (depending on weapon/nature of cover). If a unit suffers a kill an immediate reaction/morale roll is made with the effects played instantly. 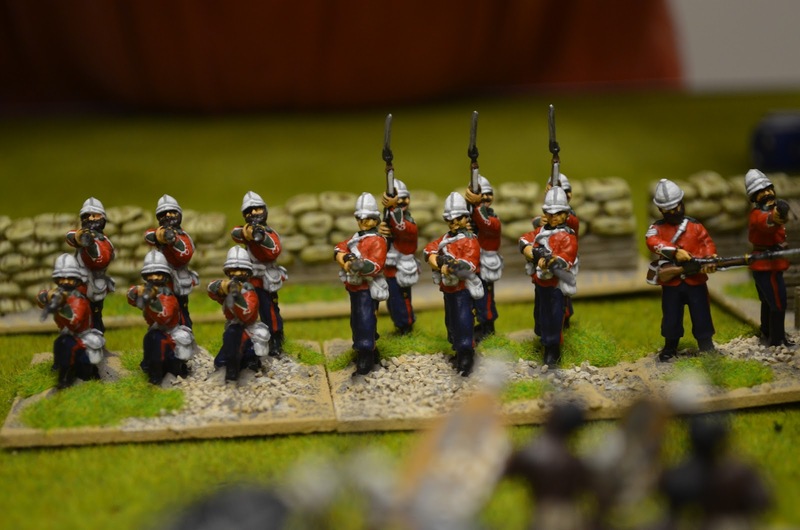 In our game units were typically driven back losing their following actions. 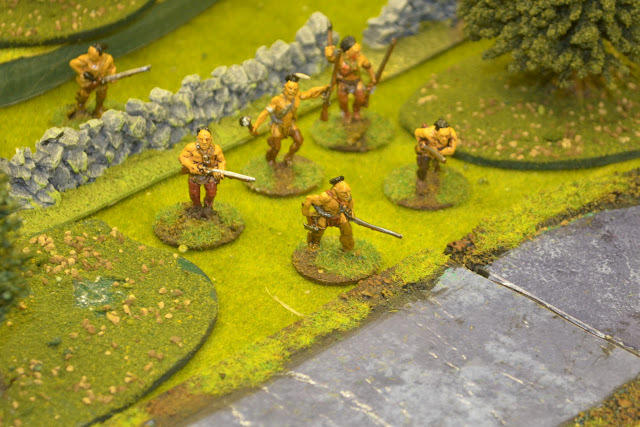 Melee is chaotic with each figure participating dicing for hits and saves against their combat and defence scores (Indians are very capable in close quarters) – the winner (determined by the unit with fewest casualties) forces the loser to make a reaction roll. In turn one the Indian Warbands, supported by a unit of Canadian militia poured into the little valley from the south. Rapidly they moved forward crossing the little stream. By the end of turn one they were poised to move towards the defensive line. 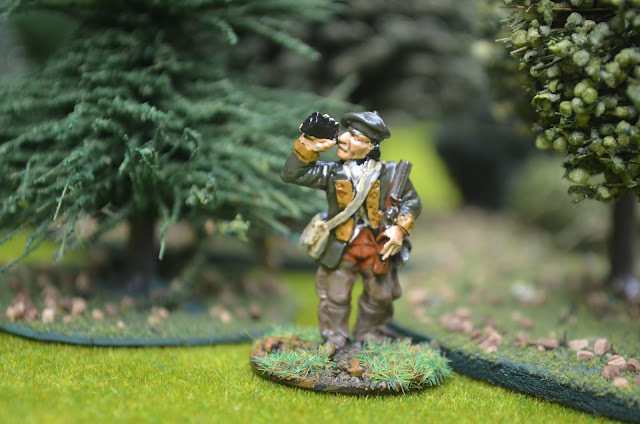 The Provincial defenders spread out on the western approaches and began to open fire on the ground recently cleared by the loggers. 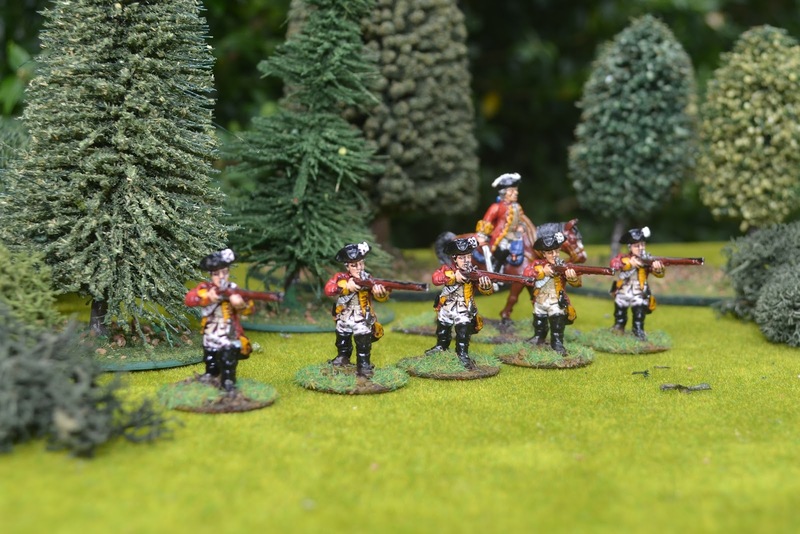 Minor casualties were inflicted but the Indians pressed forward. 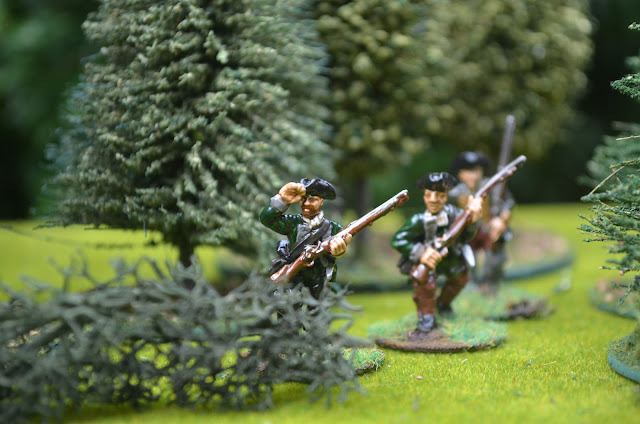 The first charge was valiantly held by the Militia but a second charge from the flank routed these poorly trained men. 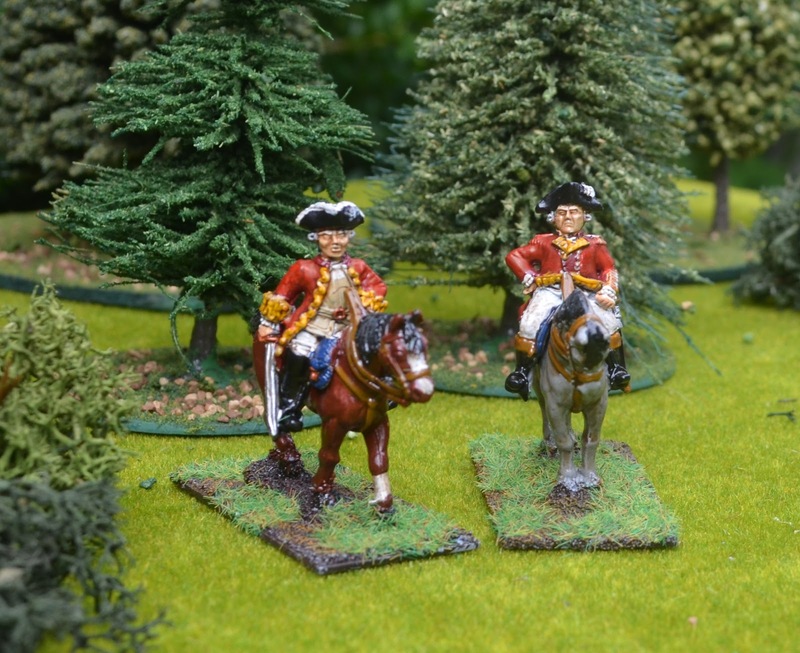 Meanwhile Rangers advanced up on the hill to face the Canadians. 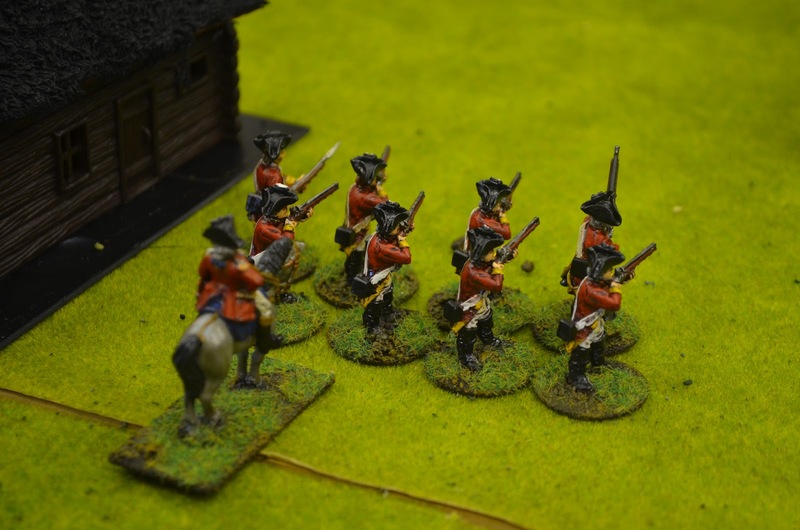 A series of shots from the French drove the rangers back into the farm stead. 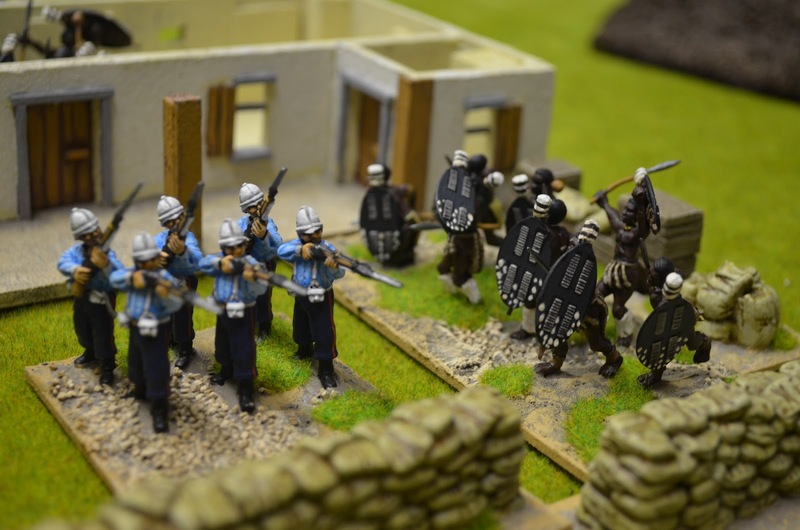 The second ranger unit deployed along the wall and engaged the Indians crossing the field. 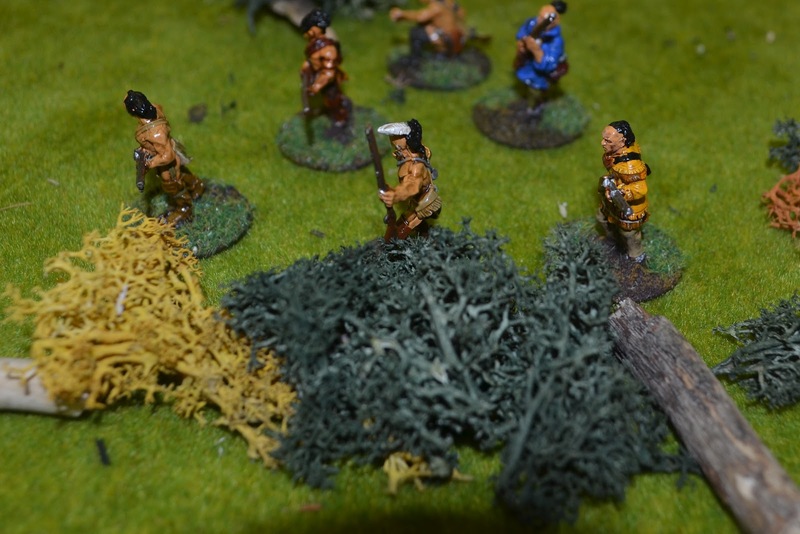 With Indians charging the Rangers behind the stone wall a bloody melee ensued. 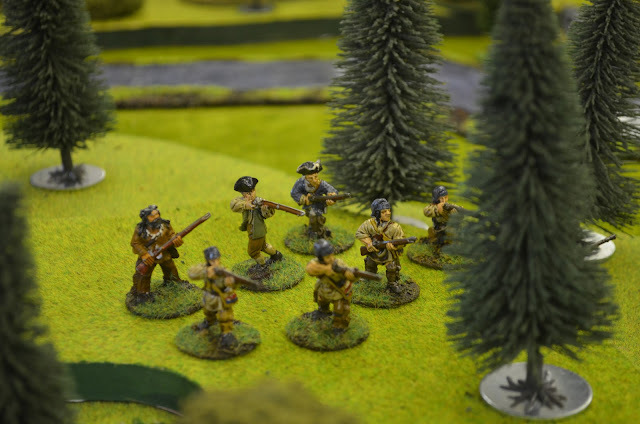 Against all the odds the Rangers held firm winning and driving back the bloodthirsty natives. 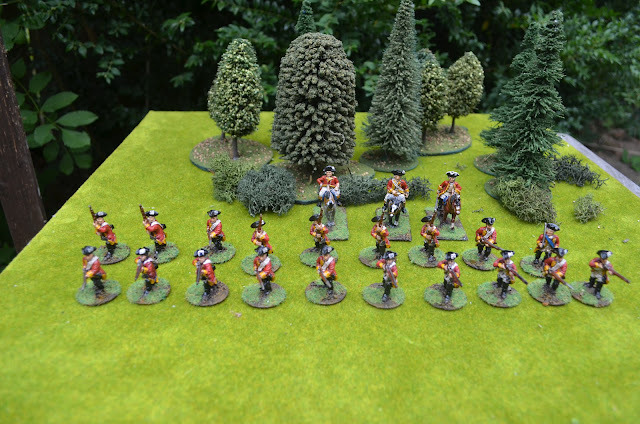 The warband moved forward and set fire to the second building but were confronted by the line of redcoats appearing in the nick of time. A firing line opened up with a volley and several braves went to meet their maker. With over half the attacking force lying dead or driven from the field Morale checks were conducted across the raiding force. They held but it was all too late, the redcoats had arrived in time. 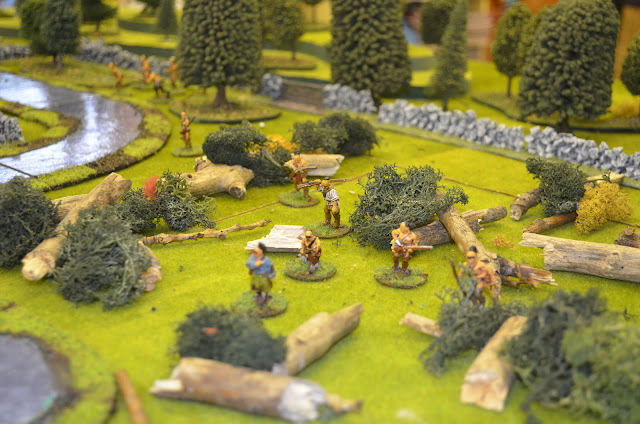 Troops move very quickly across the board and combat is fast and frenetic. We certainly felt the game had the right feel. Musket fire is a bit haphazard with cover a welcome benefit for defenders. 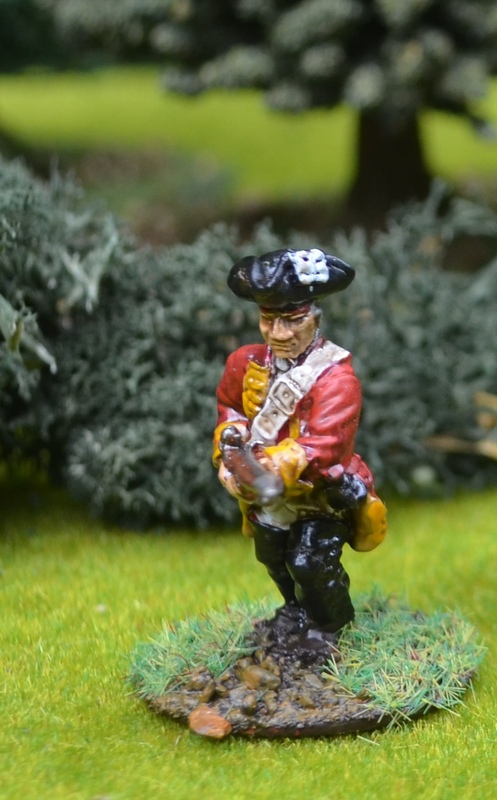 Unless you are at extremely close range do not expect musketry to decimate targets (unless lucky). Rifles are great for long range shooting but the jury is out on whether their slow reloads (two actions as opposed to one) actually pay off. 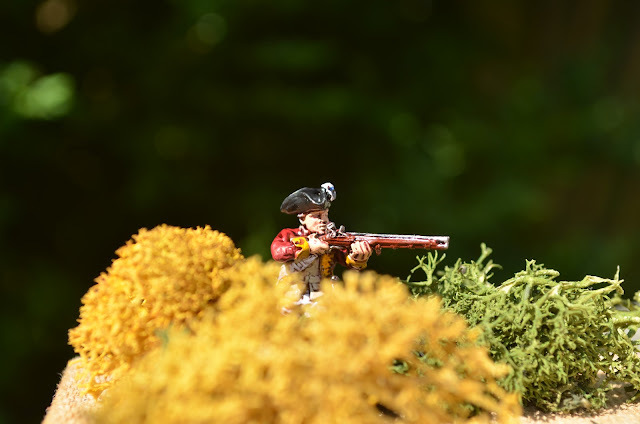 Once combat gets in close the Rifles become a liability. Perhaps the table we were fighting had too much cover? 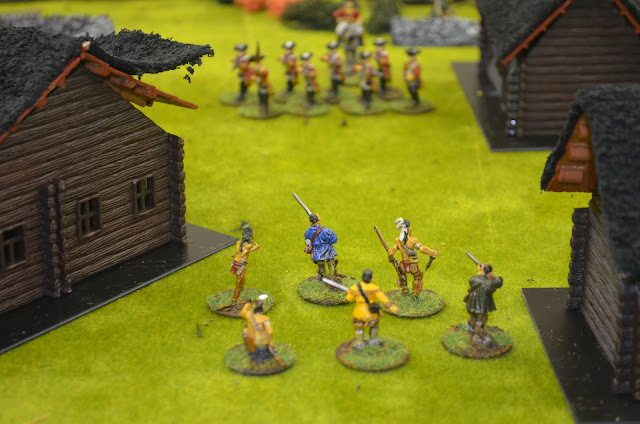 It’s fair to say that some of the dice rolling in our game was extreme, on one occasion a ranger unit was attacked in melee by twice its number of Indians. Said Rangers not only drove off the charge the following round they counter charged and routed the Indian force. With hindsight the points distribution of forces should not have been even. The attackers with a 50% stronger force would have been a better option. Next time round we will use the ‘hidden rules’, plus weather and time of day ...these may make the Indians job a little easier and truer of their raiding nature. The deck contains three random events – in hindsight I think there are too many so we will probably reduce these to one or two maximum. The game fought over a 5ft x 5ft table lasted about 2 hours and great fun was had by all. 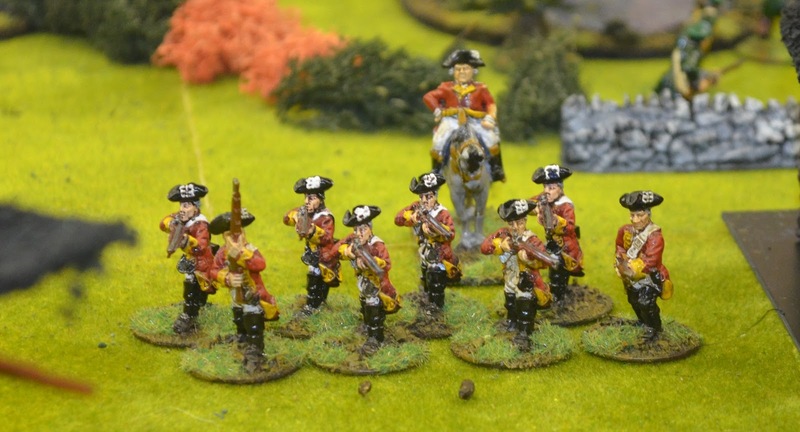 Finally managed to finish off the Rangers this weekend. Somehow I ended up with twice the number I needed but not to worry I am sure they will come in handy. A few photos of the Rangers in deployment....It will be the Indians next..
My French Indian war project is now moving forward at a rapid pace. The intention is to paint around 200+ 28mm figures that represent the various protagonists. A couple of weeks ago we were fortunate to give Matakashi’s Zulu game a whirl. This was a 28mm game loosely based on the defence of Rourkes Drift. 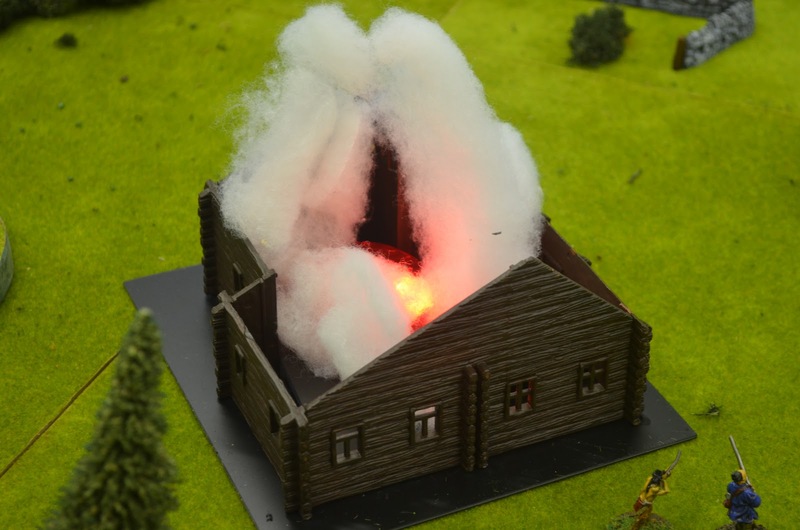 Matakashi has done a full write up of this project on his beautiful website but we had so much fun I thought it appropriate to comment here on Shed wars. The game is card driven with each side permitted a certain number of actions – these include movement, shooting and the possibility of reinforcements. When units come into contact melee follows. 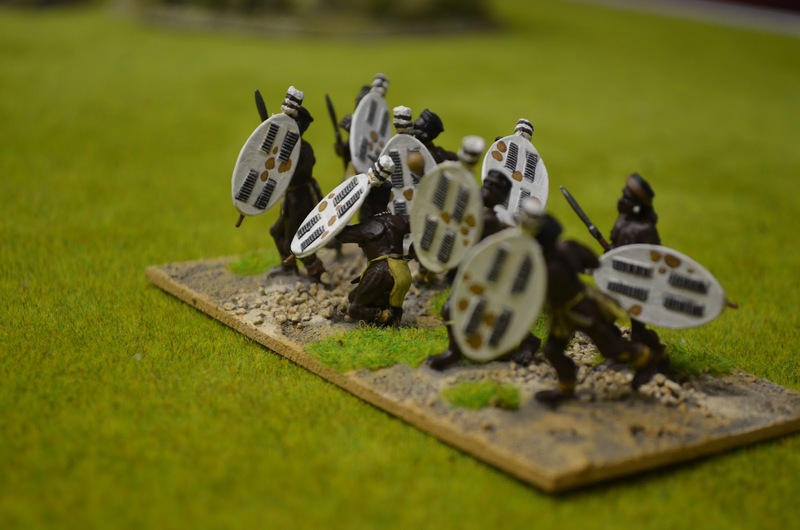 Combat is really simple a stand has number of attacks (10 for Zulus – double based and 5 for British) – the sum of all the d6 rolled equate to the number of hits – 5points in open, 10 in cover etc. 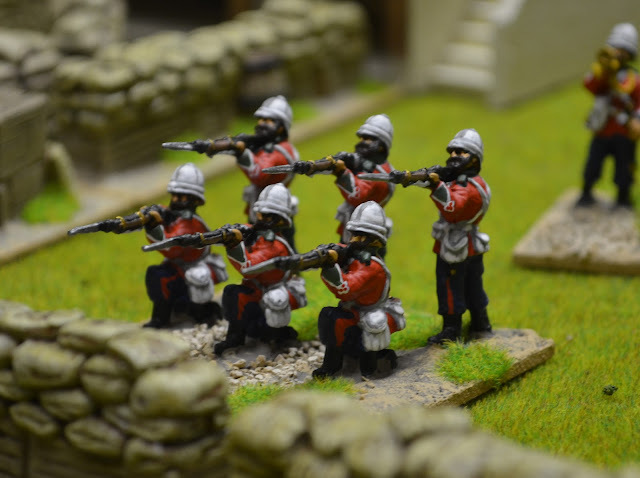 In our game a six automatically created one hit for the British this I believe will be extended to the Zulus in future games. 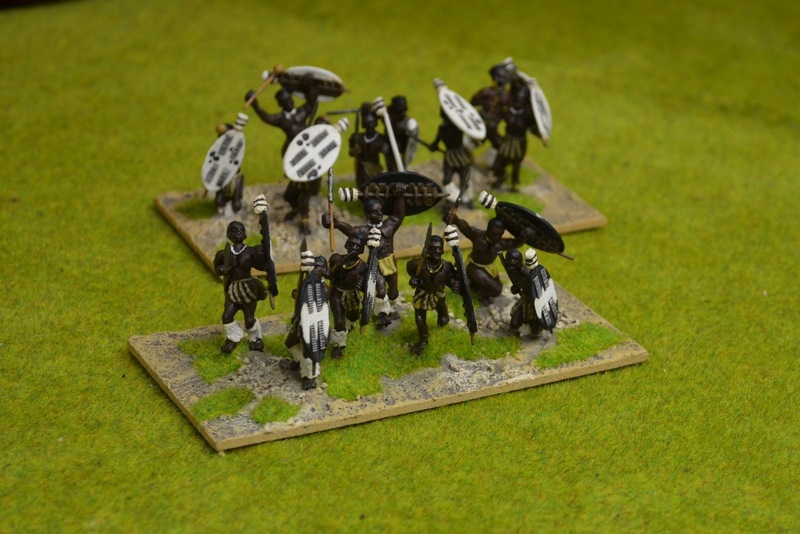 The Zulus get 10 dice rolling – 6, 6, 5, 4, 4, 3, 2, 2, 1, 1 – a total of 34. Because they need 10 points to hit the British over defended cover they score a total of 3 hits. The loser (Zulus) retire and take a hit counter. If they fail their rally roles they retreat and disappear. We managed to play three games in an evenings play. 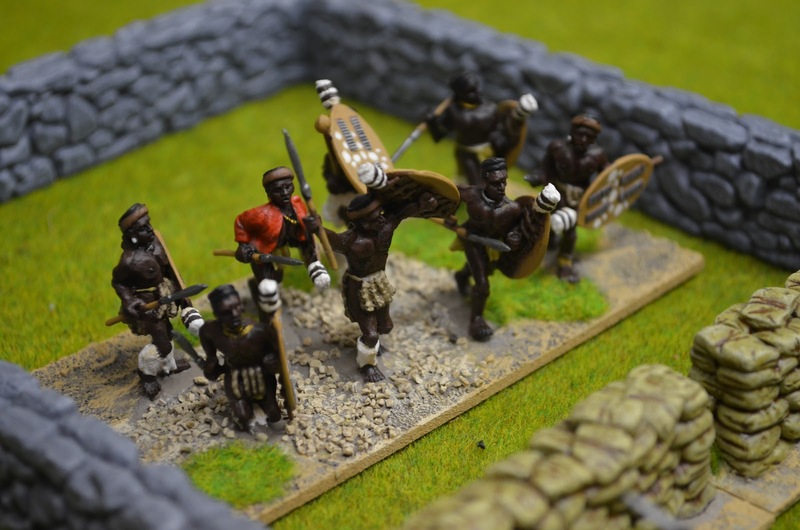 Two players controlled the Zulus and one on the British. Matakashi umpired the game. 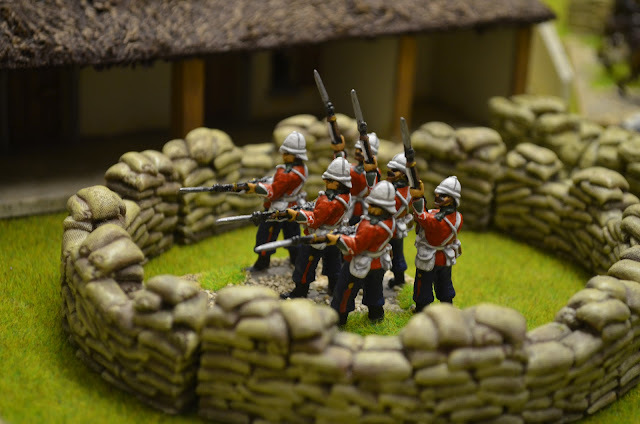 The British had a finite amount of ammo with shell cases being used to denote how much ammo was being used. 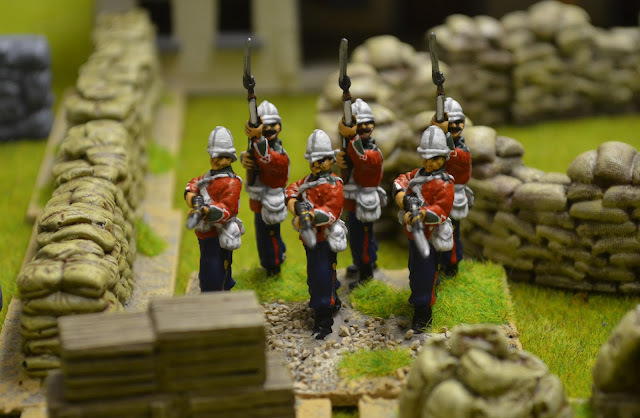 When the sound of bugles card was drawn the British knew a relief column was on the way. The deck was reshuffled and when the same card came up again the game ended. 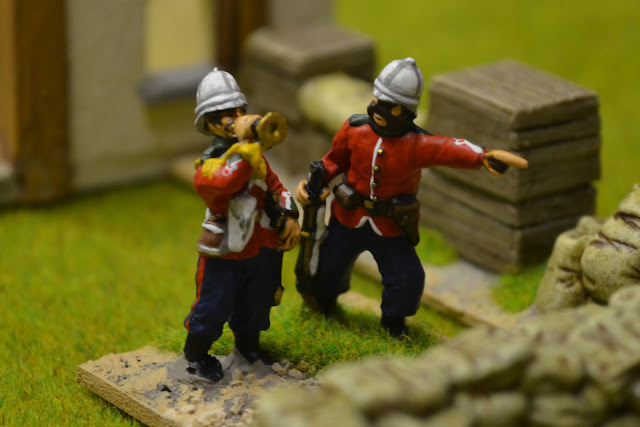 So the redcoats had to hold out and the Zulus had to wipe out the mission. 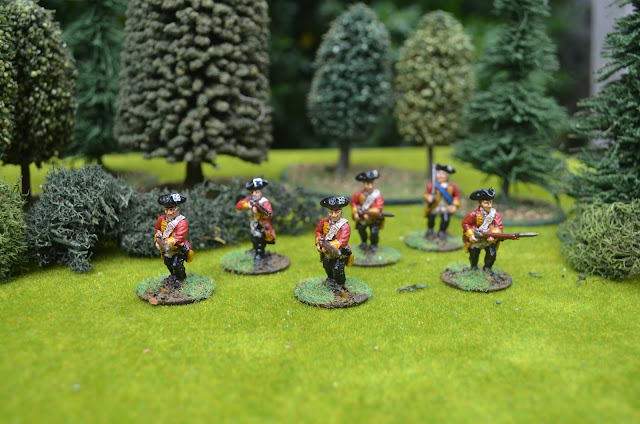 In all three games the British were successful but casualties were taken – Bromhead died twice in succession! The Zulus made it to the walls and crossed over but the firepower of the Martin Henry’s and the cold edge of steel kept them at bay.